Healthy homemade popcorn just like from the theater… but without any of the guilt?! My son and I filmed our easy, yummy popcorn-making technique on video, just for you! We use traditional red palm oil, which is similar to olive oil, although it has a higher smoke point so it doesn't smoke or burn. Red palm oil also contains Vitamin A and Vitamin E for a nutritional boost. Check out the video and print instructions below! Both of these amounts are incredibly flexible. I use a 9-quart stainless steel pot, so if your pot size is different, adjust the amounts of oil and kernels up or down. I aim to have about 1/2 centimeter layer of oil covering the entire base of my pot. You can't go wrong, really! Scoop or pour oil into pot. Let melt on medium low heat. Add kernels to the pot. Turn the heat up to medium-high or higher. Cover pot and get potholders ready because escaping steam can burn your hands. Alternatively, fold a towel and lay it on top of the lid. Just be careful not to let it hang down and touch the burner! While oil and kernels are heating, they will start to sizzle. Swish the pot firmly around intermittently, keeping the lid on and potholders shielding your hands. When kernels start popping, shake and swish the pot constantly, making sure the heat reaches all the kernels. To avoid scratching the pot, keep it just barely above the heating element but not touching. In paper bag or bowl, sprinkle generously with toppings and seasonings, to taste. Repeat above steps for another pot of popcorn, if desired. Enjoy! 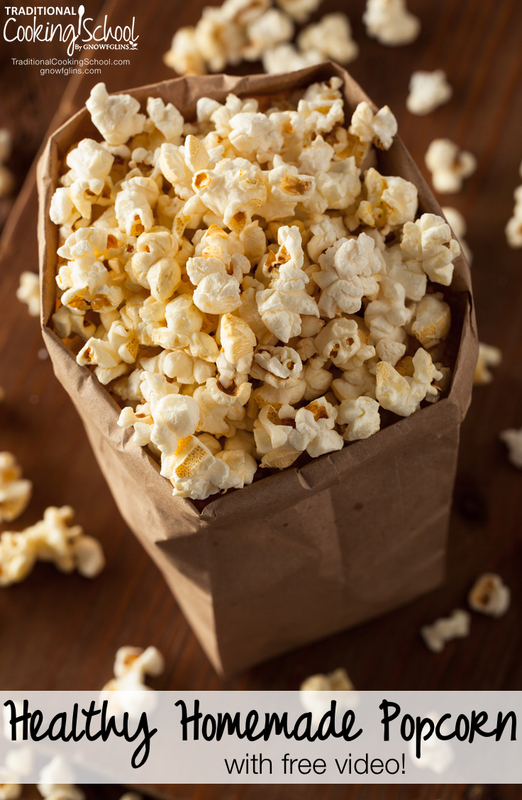 Do you make healthy homemade popcorn? What are your favorite toppings? Oh I am definitely a popcorn fan but don’t eat it very often. Normally I use coconut oil to pop it. What does the red palm oil taste like? I think I’d like to give it a try one day. Soli – Well, unbelievably on popcorn it makes it taste just like the theater. When I use it to refry rice or quinoa, it is a bit spicy and fragrant, but not overpowering (to me). I’m not so good describing flavors. I can’t imagine anyone not liking it! Now I just need to find a source for it I can afford. Since it’s only two adults in my house a big tub like yours doesn’t make sense. I would also like to know what the red palm oil tastes like. Also, where did you get the little pot you melted your butter in and the big bags for the popcorn? Valerie — I described the taste as best as I could up in my answer to Soli. 🙂 The little pot was a thrift store find of my mom. It is a Dansk ceramic coated iron pot — so cute! I’d say it holds 2 cups? And the big bags are paper sacks from the grocery store. That popcorn looks so good C.! I’ll have to try your recipe! I use coconut oil … tastes yummy … not sure how healthy it is but we like it as a treat. I use a combination of coconut oil and ghee when I make popcorn, and it’s the best popcorn I’ve ever had, even better than “movie theatre butter”. I don’t put any extra oil/butter on afterward because it makes it soggy. Even still, the popcorn tastes terrific because I used a lot of the oil in the beginning and that seems to coat all the kernels with a nice, buttery flavor without the sogginess. This is a tasty way to get the good fat into your diet. I’ve been wanting to try palm oil for a really long time. I just bought a big tub of it and can’t wait to use it woo hoo! The palm oil popcorn totally looks like the movie theatre too! That looks SO GOOD! We love popcorn here, but I use a hot air popper then drizzle some of my raw milk butter and salt. I had some red palm oil once upon a time and didn’t use it much. Do you know what the shelf life is for this oil? I love the video! I want to try the red Palm oil now too! I found a Whirly Pop at a garage sale one day and have grown to appreciate it sooo much. No need to shake the pan anymore… the little mechanism inside you simply crank while the pot is on the heat keeps the kernels coating and moving so you never seem to have any burn. It’s fantastic and it is still very friendly to our traditional mindset since there is no electricity needed. The above vid is a bit long (about 7 min) but it might be fun for some of you to watch. I recommend it whole heartedly as it makes popcorn night worry free and we have never gotten a bad batch. It’s practically effortless. I use coconut oil too but have never tried palm oil. I will definitely give it a try. maple syrup is a great idea!!! really creative. Wonderful video! C. does such a great job. Thank you for making this! Hi Wardee and C.. Great video. I’ve always just used butter to pop our corn but it does tend to burn. The only question I have is about Palm oil. It’s quite a big deal here in NZ because our farmers use a lot of Palm Kernel Extract (PKE) to feed their cows. This is the ‘waste’ after extracting the palm oil. My understanding is that the palm oil industry is leading to widespread deforestation of tropical rainforest so I have gone right off using it, not wanting to be responsible for destroying someone else’s ‘place’. Sorry to sound negative when I do love your approach to all that our creator has given. Sue Rine — That’s really interesting. And sad. I’m glad you pointed that out. When we first got red palm oil from Wilderness Family Naturals, I contacted them to find out the source of their oil. They assured me they were acquiring oil from small family farms that were not contributing to rain forest deforestation. I have no reason to doubt WFN as they’ve shown themselves to be a trustworthy company — however, it would be good to verify the ‘source’ of whatever oil one chooses to use! That’s good to hear. Some years ago I bought 25kg solid white palm oil from the place I get my other organic supplies. I’ve been scared off since all the publicity about it, but I guess I should check their exact source. It was from Columbia but I need a bit more info. Thanks for your response. I certainly liked the results of baking with Palm oil. Even better than butter. I’ll have to try the red palm oil. I actually found that if i put the salt in the oil in the pan with the popcorn, it distributes it quite well. That’s a good idea, DeDe. I’ve always wondered if that would work. How much salt do you add to how much oil/popcorn? Yay! Loved this video. We have made popcorn on the stove since I was a child. Love to see the traditions being passed down to other generations. Nice job C.! I am also going to give the palm oil a try. Is there a reason you don’t use a local source for your oils? Mountain Rose Herbs is in Eugene, although I am happy to find another source to buy our oils from as well. I just wondered and didn’t mean any disrespect with the question 🙂 Thanks for this website! I’ve been looking for a place where God is given the glory for a natural lifestyle! This is the ‘waste’ after extracting the palm oil. It is a Dansk ceramic coated iron pot — so cute! Thanks for the video! My 7 year old nephew and I made some this weekend- when I told him what we were having for a snack he said ” But where is your microwave?” I told him I don’t have one and we were making it on the stove the old fashioned way! We used organic white corn popped in organic coconut butter, topped with melted butter and himalayan pink salt….amazingly good! My nephew got a real kick out of it. He measured the corn, poured it in the pan, I worked the pan on the burner. My stock pot has a clear glass lid, so it was a treat being able to watch the popcorn pop! The oil I saw you (red palm) was liquid. Mine is solid. I have to melt it when using. Then when it cools for awhile it solidifies again. Is there a difference? Wendy — If the room temp is cooler, this oil will be solid. I hope this helps. Enjoy! I hope red palm oil has a better taste than coconut oil. Do you use white or yellow kernel popcorn? I made this last night with the red palm oil, butter and buffalo rub seasoning! Yum!! Red palm oil tastes makes the popcorn taste buttery! Not like coconut oil at all. My son is allergic to corn. I’m looking forward to trying the method with popping sorghum. I have done it with popcorn twice for my husband and it’s delicious. I use rendered bacon fat, tastes amazing. Ok, so I soak grains, beans and nus… do you soak popcorn kernels? make that nuts not bus! I pop ours in Ghee and it’s nothing short of amazing! Mica is adorable. What a great kid! I highly suggest you read up on palm oil. I’ve been looking for non gmo corn kernels.. does anyone know where to get them? I don’t have any connection to TBM but I am certainly a customer!! I had read that no Popcorn is GMO…yet, anyway ? 🙁 If anyone has heard differently…I would really like to know…. Growing up without electricity or running water we grew and popped our popcorn on a woodstove and made balls. Great memory. Thanks for the tip on the red palm oil. I’ve been using coconut oil for stovetop popping but, because I try to keep it from smoking, I don’t cook long enough for all the kernels to pop. The higher smoke point really interests me. Update: I purchased and tried this red palm oil and here are my observations. It’s a pretty nice product. For those of us who have been using coconut oil it’s kind of a toss up. The flavor we’ve come to love isn’t there but it is still good, doesn’t smoke as readily and cleanup is easier in my opinion. The coconut oil needs to be wiped out of the pan before washing or it doesn’t wash well – even in the dishwasher. –I’ve been using alot more paper towels lately. 🙁 The red palm oil emulsifies readily in warm water especially with a little soap so easy cleanup. Yum! I cook it in a combination of coconut oil and butter. Then sprinkle with some Celtic sea salt. So good! What’s the phytic acid content of that? I’m surprised you don’t recommend using organic (non-GMO popping corn). It really does taste even better than theater popcorn! What other oil can be used? I have olive and coconut would that work? From where do you source your kernels? I use rice bran oil and top with pink Himalayan salt, I find myself having to make a batch every second day, it doesn’t last long in my house! Haha, Wardee, how about an update on this? Your son is probably taller than you now I bet! I have red palm. Will have to try it. But we’ve been using an air popper because it’s less messy and no one gets burned. Sweet video! I have never tried red palm oil. I hear it has a distinct taste that takes getting use to. Thank you for sharing this great recipe! We usually use organic palm shortening from Tropical Traditions for frying. Is this good to do so, or would you recommend using the red palm oil instead? We cook Mexican food at least once a week and use the palm shortening with that as well. My husband loves movie popcorn so much that he chooses what theater to go to based on the popcorn, and he loves this recipe! How can you have ignored the most important ingredient? Organic!! The best reason of all for making your own popcorn is to make organic so no GMOs! We had popcorn popped in coconut oil and sprinkled generously with nutritional yeast, organic cheese powder and salt for lunch today with banana “milkshakes”. Homemade organic popcorn is a million times better than disgusting theater popcorn!!! Every Sunday I pop our popcorn in coconut oil, pour melted grass fed unsalted butter over it and sprinkle it with Celtic sea salt and nutritional yeast. It is one of my favorite snacks. I ran out of coconut oil this week so I used my own processed organic lard…next I’m gonna try the red palm oil. Great idea. After popping in coconut oil, we use high lignan flax seed oil and sea salt on ours. Tastes SO good!